A 2 dram* (1/4oz) glass dropper bottle of Citrus Stem Cells. *You may choose a larger size. The architect of skin. Orange stem cells. Organizes the inner structure of the skin for a younger appearance. Tighter, firmer skin will help your skin to appear younger! The Claim To Fame is: "regain the elastic properties of a skin 12 years younger". We are not stopping there. Keep applying this amazing serum every day and continue the progress. Regain the elastic properties of a skin 12 years younger. Organize the inner structure for a younger appearance. Protect against high levels of free radicals. Organize and redensify the dermis structure. Improve micro relief for smooth velvety feel. Reduce wrinkles and improve global aspect. Apply your actives directly to the skin for the strongest effect, or add into your favorite creams and serums to create a "super product" of your own. *Dare we suggest adding these actives into our Derma Snap 8LM or GABA Elite creams - which are both already teaming with penetration enhancers and other proven actives???? 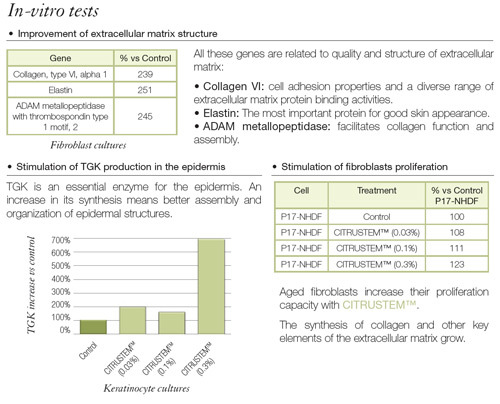 CITRUSTEM™ is the first launch in the Provital Stem Cells Collection. It is produced from stem cells obtained from the orange (Citrus sinensis). These stem cells contain amino acids, especially proline and betaines (proline betaine and glycine betaine); as well as organic acids, sugars, peptides and proteins. Proline and various betaines, act as osmoprotectants and cryoprotectants when they accumulate in the cellular cytoplasm. They protect the cell from saline or temperature changes and maintain the osmotic cell balance in response to stress. In addition, another defense mechanism in Citrus stem cells against oxidative stress is the expression of Cit-SAP, a protein with considerable homology to glutathione peroxidase (GP) in mammals, which protects against high levels of free radicals. When applied topically, the stem cells of CITRUSTEM™ bring these defense mechanisms to our skin, to protect cutaneous cells against attacks. Obtained from orange stem cells, CITRUSTEM™ increases the expression of genes capable of improving the structure of the extracellular matrix. CITRUSTEM™ organizes and redensifies the dermis structure, by increasing the synthesis of the elements forming the extracellular matrix. A structured dermis translates into a regular and defined micro relief. The skin recovers its smooth and velvety feel. The skin appears renewed, wrinkles are reduced, and its global aspect is improved. Skin looks younger! 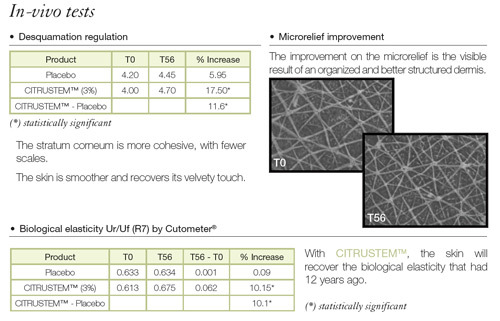 With CITRUSTEM™ the skin regains the elastic properties of a skin 12 years younger! The skin elasticity decreases and wrinkles appear. The microrelief structure becomes more anisotropic resulting in a loss of softness and velvety touch. Obtained from orange stem cells, organizes,restores and redensifies the dermis structure to recover the quality of a young skin. *By taking our 35% potion and mixing a 1/2 vial (1 dram or 1/8oz.) into a 1oz. (30ml.) product you will end up with a finished product of 2% Citrustem™. You may increase the strength by increasing the active quantity. Apply this powerful elixir to your problem areas 2x daily before all other serums or creams. Expect to see noticable changes within 30-45 days. Purified water, Glycerin, Citrus Aurantium Dulcis (Orange) Callus Culture Extract, Ethoxydiglycol, Sodium Hyaluronate, Xanthan Gum, Polysorbate 20, Gynostemma Pentaphyllum Extract, Panax Ginseng Root Extract, Methylisothiazolinone.